11.1 This message provides dynamic information concerning a specified geographic area, polyline or positions. 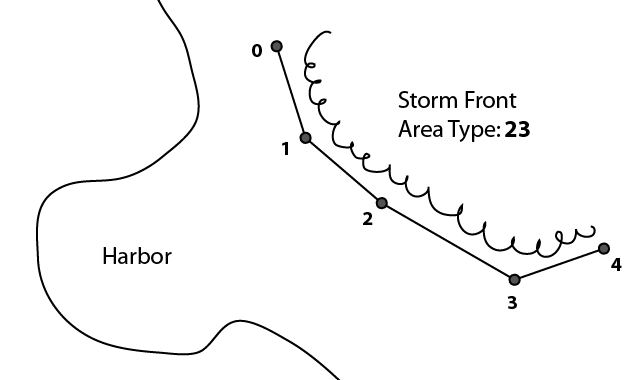 It should be only used to convey pertinent time-critical navigation safetyinformation to mariners or authorities, and not as a means to convey information already provided by current official nautical charts or publications. 11.2 This message can also be used to convey advisory lines or tracks. However, the Route Information message should be used for recommended or directed routes. 11.3 The information is time-dependent (i.e. has start date and time and duration). 11.4 In order to allow advance notice, this message should be transmitted prior to the start date and time specified for the area. It should not be transmitted more than one day in advance. 11.5 This message should not be transmitted beyond the end date and time, except for a cancellation message. A cancellation message can be transmitted before the designated end date and time using the same Message Linkage ID with an Area Type of 126 (cancellation), a Duration = 0, and start date and time fields all set to not available. 11.6 ECDIS/ECS software should automatically remove the area notice from the display after the end date and time specified or after receiving a cancellation message. 11.7 Up to 5-slots message can be created, however messages with more than 3 slots should be avoided. Messages with more than 3 slots are less likely to be received due to radiofrequency noise or packet collision. 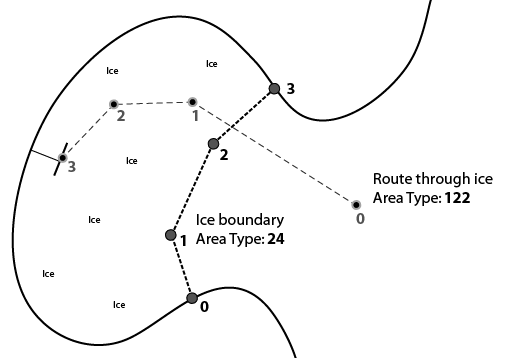 11.8 Waypoints can be specified using the polyline/waypoint sub-area. In case more precision is to be required then multiple circle/point sub-areas can be defined (e.g., one for each waypoint). 11.9 When waypoints are specified using polyline or circle/point sub-areas, they should be numbered and used in the order that they appear in the message. 11.10 Polyline/polygon sub-areas must follow immediately after a point sub-area (Area Shape 0) in the same Area Notice message. 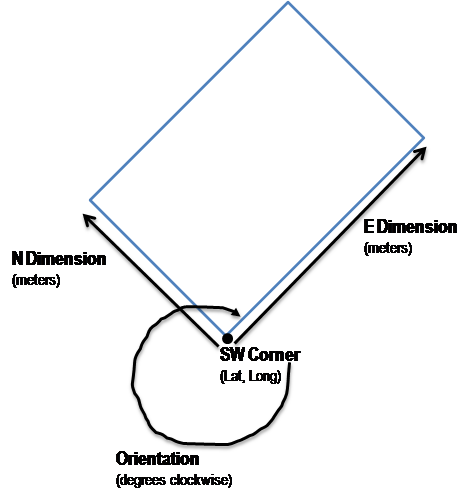 The point defines the start of the line segments. If more than 5 points were required for a polyline/polygon, then additional polyline/polygon sub-areas could be used. However, they must follow immediately after the first polyline/polygon sub-area. 11.11 The Message Linkage ID can be used to link additional text (e.g., a separate text message). However, both the Area Notice and additional Text Description message should be sent by the same source MMSI. 11.12 The total area defined by one Area Notice (one Message Linkage ID) is the union of all of the sub-areas contained in the message. 11.13 If the same Message Linkage ID is retransmitted with different sub-areas and/or times, then the ECDIS/ECS should replace the old Area with the new. 11.14 The Message Linkage ID must be unique across all binary messages to which it applies. In this way, the Message Linkage ID and Source MMSI are connected to the same text message. Standard Message Header Message ID 6 Identifier for Message 8; always 8. Repeat Indicator 2 Used by the repeater to indicate how many times a message has been repeated (see ITU-R M.1371-3, Annex 2, § 4.6.1). Source MMSI 30 MMSI number of source station. Spare 2 Not used. Set to zero. Application Data Message Linkage ID 10 A source specific running number, unique across all binary messages equipped with Message Linkage ID. Used to link additional information to the message by a Text Description message. The Message Linkage ID and the first six digits of the source MMSI uniquely identify the sent message. Start date and time of Area UTC Month 4 Start UTC month of the Area notice. UTC Day 5 Start UTC day of the Area notice. UTC Hour 5 Start UTC hour of the Area notice. UTC Minute 6 Start UTC minute of the Area notice. Duration 18 Minutes until the end of Area notice, measured from start date and time of Area Notice. Sub-areas max 870 From 1 to 10 sub-areas, each structured as in Tables 11.4 – 11.9. A short text description may be associated with the areas using Sub-area 5: Associated text (see Table 11.10). Total number of sub-areas is determined by the length of the message. Each sub-area is a fixed 87 bits. Area Shape 3 Defines the shape of the area. Scale Factor 2 Scale factor. This is a multiplier for the dimensions of the shape. 1 (default), 10, 100, & 1,000 (scale factor = 10n where n=decimal value of scale factor). Longitude 25 Longitude of the centre in 1/1,000 min, ±180 degrees as per 2’s complement (East = positive, West = negative). Latitude 24 Latitude of the centre in 1/1,000 min, ±90 degrees as per 2’s complement (North = positive, South = negative). Precision 3 Precision of data in latitude and longitude parameters. Data to be truncated to the number of decimal places specified in this parameter. Radius 12 Defines the size of the circular area. This is the radius of the circle in metre steps. This is multiplied by the scale factor to give a maximum size of 4,095,000 metres (4,095 km). Spare 18 Not used. Set to zero. Longitude 25 Longitude of the SW corner in 1/1,000 min, ±180 degrees as per 2’s complement (East = positive, West = negative). Latitude 24 Latitude of the SW corner in 1/1,000 min, ±90 degrees as per 2’s complement (North = positive, South = negative). E dimension 8 Box dimension East from the corner point, in metre steps. This is multiplied by the scale factor to give a maximum dimension of 255,000 metres (255 km). 1 – 255 * scale factor metres. N dimension 8 Box dimension North from the corner point, in metre steps. This is multiplied by the scale factor to give a maximum dimension of 255,000 m (255 km). Orientation 9 Rotation of area, in degree steps. Area is rotated clockwise this number of degrees about the position above. Spare 5 Not used Set to zero. Area Notice: Sub-area Area Shape 3 Defines the shape of the area. Radius 12 Defines the size of the sector, in metre steps. This is multiplied by the scale factor to give a maximum size of 4,095,000 m (4095 km). Left Boundary 9 Orientation of the left boundary edge of the sector, in degree steps measured clockwise from true North about the centre point. Right Boundary 9 Orientation of the right boundary edge of the sector, in degree steps measured clockwise from true North about the centre point. The total sector area is the area measured from the left boundary clockwise to the right boundary. Spare 0 Not used. Set to zero. 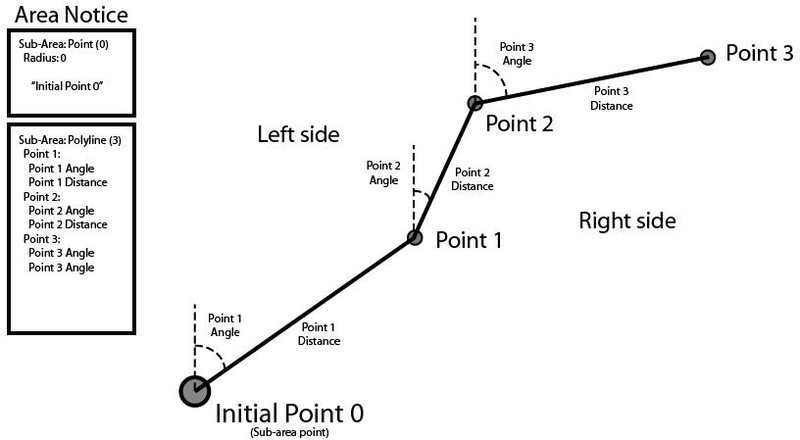 Point 1 Angle 10 True bearing, in half-degree steps, from Point 0 to Point 1 or from the last Point in a Polyline directly preceding this Polyline. Point 1 Distance 10 Distance, in metre steps, from Point 0 to Point 1 or from the last Point in a Polyline directly preceding this Polyline. This number (1 – 1,023) is multiplied by the scale factor to give a maximum of 1,023,000 metres (1,023 km). 0 = default (no point). Point 2 Angle 10 True bearing, in half-degree steps, from Point 1 to Point 2. Point 2 Distance 10 Distance, in metre steps, from Point 1 to Point 2. This number (1 – 1,023) is multiplied by the scale factor to give a maximum of 1,023,000 metres (1,023 km). Point 3 Angle 10 True bearing, in half-degree steps, from Point 2 to Point 3. Point 3 Distance 10 Distance, in metre steps, from Point 2 to Point 3. This number (1 – 1,023) is multiplied by the scale factor to give a maximum of 1,023,000 metres (1,023km). Point 4 Angle 10 True bearing, in half-degree steps, from Point 3 to Point 4. Point 4 Distance 10 Distance, in metre steps, from Point 3 to Point 4. This number (1 – 1,023) is multiplied by the scale factor to give a maximum of 1,023,000 metres (1,023 km). Set to 4 for Polygon (closed area). Scale Factor 2 This is a multiplier for the dimensions of the shape. 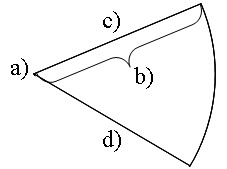 Point 1 Angle 10 True bearing in half-degree steps, from Point 0 to Point 1 or from the last Point in a Polygon directly preceding this Polygon. Point 1 Distance 10 Distance in metre steps, from Point 0 to Point 1 or from the last Point in a Polygon directly preceding this Polygon. This number (1 – 1,023) is multiplied by the scale factor to give a maximum of 1,023,000 metres (1,023 km). Point 2 Angle 10 True bearing in half-degree steps, from Point 1 to Point 2. Point 2 Distance 10 Distance in metre steps, from Point 1 to Point 2. This number (1 – 1,023) is multiplied by the scale factor to give a maximum of 1,023,000 metres (1,023 km). Point 3 Angle 10 True bearing in half-degree steps, from Point 2 to Point 3. Point 3 Distance 10 Distance in metre steps, from Point 2 to Point 3. This number (1 – 1,023) is combined with the scale factor to give a maximum of 1,023,000 metres (1,023 km). Point 4 Angle 10 True bearing in half-degree steps, from Point 3 to Point 4. Point 4 Distance 10 Distance in metre steps, from Point 3 to Point 4. This number (1 – 1,023) is multiplied by the scale factor to give a maximum of 1,023,000 metres (1,023 km). Area Notice Sub-area Area Shape 3 Defines the shape of the area. Set 5 for Associated text. This text is associated with the area defined in this binary message. Multiple Associated text sub-areas are glued together in the order they appear in the message. Text 84 14 characters 6-bits ASCII characters, as defined in ITU-R M. 1371-3, Table 44. If less than 14 characters are required, then the remainder of the field should be filled with “@” characters.